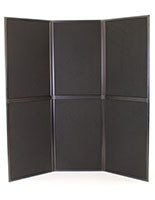 Portable Display Panels Equipped With 6 Black & Gray Panels! 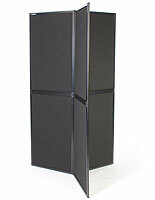 Folding design creates either a triangular or wall-like display. 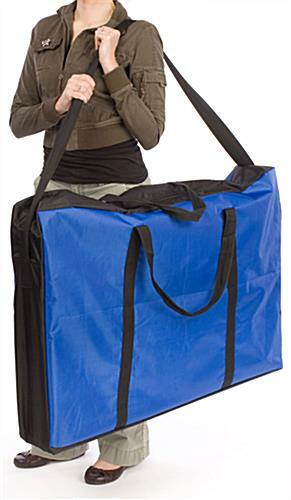 Knockdown system easily packs down into the included carrying bag. 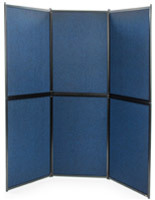 Hook-and-Loop panels will accept our acrylic literature & sign frame accessories. 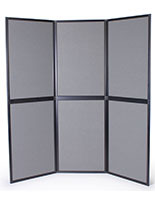 This portable display panel features six hook and loop receptive panels you can use to create a presentation saturated with eye-catching graphics and informative pamphlets. 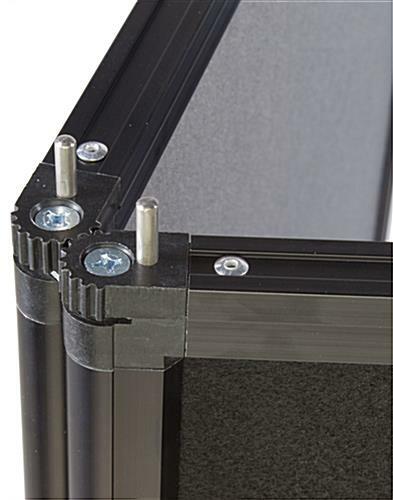 The pop up fixture, portable display panel is comprised of two separate sections, therefore making it extremely easy to set up and transport. 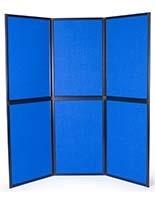 The portable display panels, also known as portable displays, are even equipped with its own carrying bag. This trade show display uses its folding design to create a 360° triangular fixture. 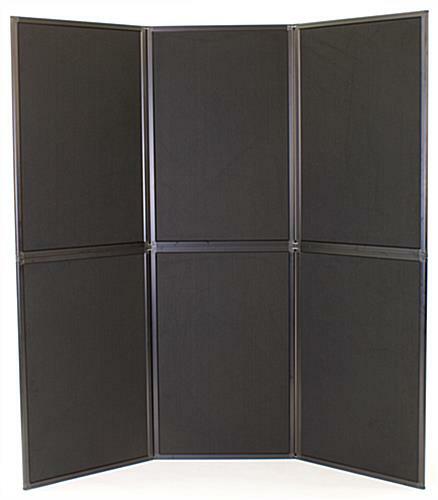 You can also use portable display to create a 6-panel backdrop, perfect for use in trade show booths. 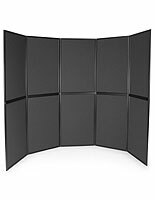 We provide these portable display panels with two different colored panel options (black and gray) to match any décor and personal preference. While the gray fabric creates a more neutral backdrop for your displayed graphics, the black option will truly make them stand out. 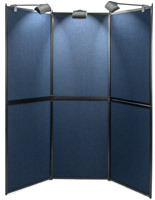 The portable fixtures, portable display panels feature an aluminum construction to increase its overall stability and durability while on display. This also means your trade show display will last through multiple uses and frequent travel. 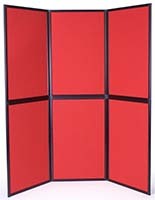 The portable display panels, such as pop up displays, are easy to set up yet will provide you with an incredible versatile and reusable presentational tool. Please Note: This trade show display may require two people for proper assembly. 67.5" x 70.9" x 23.5"
23.5" x 35.4" x 2.5"
Thanks for the review, Dutchess. When you do try it out at that event, feel free to share a photo of it in use on our Facebook wall! We love it when our customers show off their products "in action!" I bought one of these from Displays2go several years ago; Just purchased the second it is the same quality as the first. Thank you for the review Patrick, and thank you for your repeat business! We have not actually used these display boards, but did take it out and set up. No instructions were included. Very nice, fast & easy to assemble with no instructions. We appreciate you taking the time to write the review, Natalie. Thank you! Thanks for sharing your photo and review, Shelley. This was better than we expected it to be! It was exactly what we needed! Perfect! Quick Ship! Great! What a great review! Thank you for the feedback, Jeff!